PRESS stands for "PRedictive Error Sum of Squares", or "PREdiction Sum of Squares" . It is calculated by summing all prediction errors during cross-validation. A low PRESS value indicates a good prediction model. 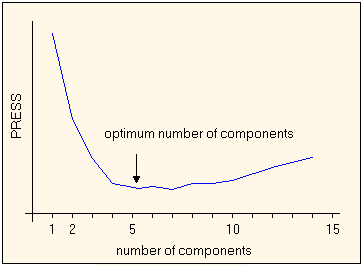 The PRESS can be used to find the optimum number of components by a stepwise variable selection procedure. The "best" model consists of as few predictor variables as possible and shows the lowest (or almost the lowest) PRESS. In the figure below you see an example of a hypothetical variable selection procedure, resulting in the "best" model of 5 predictor variables. Note: a disadvantage of using the PRESS value is the enormous number of calculations envolved with the PRESS. This is especially true for calculation intensive models (such as neural networks) and large data sets.